Lately my hair has been in a bit of a mess. Thanks to refusing to have it cut, letting it dry naturally without having combed through it and over-washing it, it's become a bit of a frizzy-split-end-Hagrid-mess. This being the case, I've really had to up my game haircare-wise and crack out all my top favourite nourishing and restoring hair products to bring it back to life. 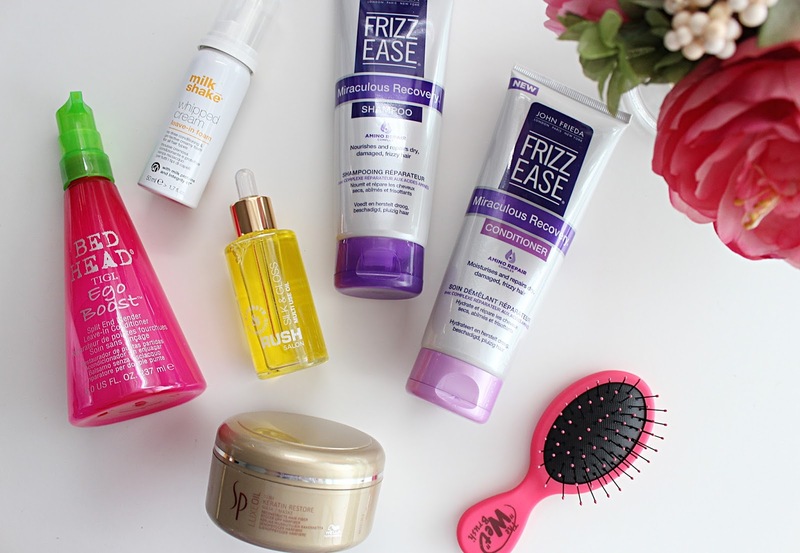 The Frizz Ease Miraculous Recovery* range was my first port-of-call for this - designed to reverse a huge 75% of surface damage and make your hair three times smoother, I had high hopes that the shampoo and conditioner would work wonders for my hair. And it most certainly did - after each wash my hair felt softer, stronger and smoother - and whilst my split hands didn't miraculously disappear, my hair felt much healthier. Speaking of split ends, to keep mine in check I've been using Tigi Bedhead Ego Boost Split End Mender*, which is basically a leave-in conditioner that targets split ends and helps to add strength and elasticity. It smells fab, a little bit goes a really long way and it makes my hair feel much smoother - definitely a must-have product if you suffer with lots of split ends! Milk_shake Whipped Cream* is another leave-in conditioner that I absolutely love. This smells insane - almost good enough to eat (but obviously, don't), and as well as leaving my hair feel so soft it also makes my usually ridiculously knotty hair so much easier to manage. It's one of those products that is just a total pleasure to use. Obviously, keeping my hair in tip-top condition means using an oil. It's strange to think that a few years back oils were few and far between, but now they're a must-have in everyone's haircare regime. I'm currently loving the Rush Haircare Multi-Use Oil* from M&S -with a mix of Vitamin E, argan oil and inca inchi oil, it really hydrates my hair and leaves my normally ratty, dry-feeling ends feeling smooth and hydrated. One of my ultimate favourite nourishing haircare products has got to be the SP Luxe Oil Keratin Restore Treatment Mask*. I definitely need to make the effort to use this more often because when I do use it, the results are always so, so good. It basically leaves your hair feeling as smooth and soft as it does when you have a treatment at the hairdressers, and the best thing is it's a really affordable price for what it is. I love it. Finally, I couldn't do a nourishing haircare post without including my trusty Wet Brush*. Although it's not a nourishing product as such, it is a must-have for making my hair feel soft and knot-free. Whereas a lot of brushes pull and break your hair, this one is the best I've found for untangling it without leaving you pulling out loads of hair. I wouldn't be without mine now! What are your favourite nourishing hair products? Let me know!